A young woman washing her hair in a shower. Neutrogena markets its original T-Gel shampoo to help you both clean your hair and combat the flaking skin attributed to skin disorders like seborrheic dermatitis or dandruff. The product includes a wide array of chemicals designed to accomplish the hair results you want while maintaining the shampoo's appearance, smell and stability. Neutrogena lists coal tar as its sole active ingredient at a strength of 0.5 percent. 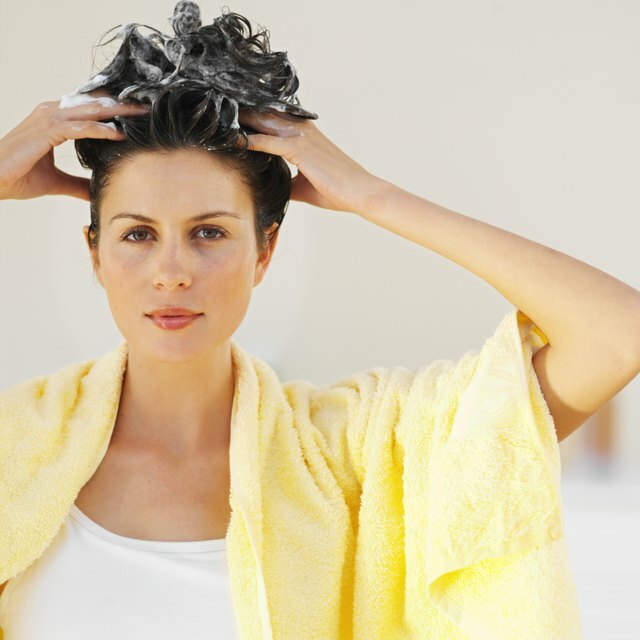 Coal tar is one of several active ingredients that the National Institutes of Health say can effectively combat dandruff. A clinical review published in 2008 in the "International Journal of Toxicology" noted that such topical uses of coal tar in shampoo are safe and effective, though other methods of tar application, such as injection, may cause numerous health maladies, including breathing problems. Water is the main inactive ingredient in Neutrogena's T-Gel shampoo. It acts as the fluid base in which its other ingredients work. The shampoo holds several detergents and cleansing agents, including cocamidopropyl betaine, sodium laureth sulfate—Columbia University's Health Services warns that you may experience skin or eye irritation when using a product with this sulfate—and laureth-4. Cocamide DEA works as a foaming agent to make Neutrogena's product bubble when applied to your hair, and also helps make the shampoo thicker in viscosity, according to the Environmental Working Group. Several chemical preservatives are included by Neutrogena to ensure a stable, long-lasting shelf life for the T-Gel shampoo. This includes imidazolidinyl urea, methylparaben, propylparaben, citric acid, sodium chloride—a technical name for plain table salt—and tetrasodium EDTA. Neutrogena incorporates artificial fragrances into the T-Gel shampoo to help mask its chemical smell and make its usage more pleasant. The company doesn't specify the exact chemical or fragrance used. Columbia University's Health Services: Does Sodium Laureth Sulfate Cause Cancer?